The day after we got back from spending 3 days in Bloomington seeing the Dalai Lama, I had to fly to Las Vegas. What a difference! This was my first time there and I had a blast. It’s like Disney World for adults and I love Disney World! I went to an Advanced Delphi programming class and a 1-day Java Overview class (which is why you don’t see any fancy Java stuff on my page yet…) My husband flew down Tuesday evening and stayed until we went home on the following Sunday. This was our first time in Las Vegas. Neither of us gamble so that made it nice. We did finally blow $5.00 in nickel slots on Saturday. It was hot! Over 100 degrees every day! I guess it is true what they say about a dry heat though since it was bearable and not even really *all* that unpleasant and although we did basically just go from casino to casino, we walked most of the places so we spent time outside. The big highlights of our trip were the 2 shows we saw. We saw the Cirque du Soleil show, Mystere’ and it was awesome. Unbelievable. I cannot even begin to describe it except to say that if you get a chance to go to their show, go. And try to sit near the center, quite far back. Much of their performance is way above the stage and is best viewed from about 10 rows from the last or so. 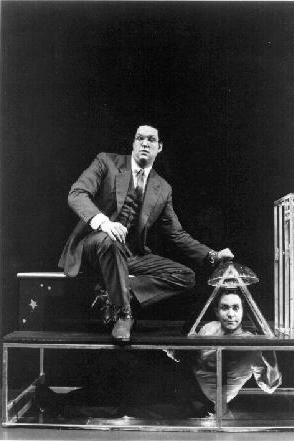 And as the very best of luck would have it, Penn and Teller were playing at Bally’s! We are extremely big fans of theirs and this was the first time we’ve seen them live. We were in the very front row of tables and it was perfect! They were very good and very personable. They waited outside the doors to the room after their show was over and shook hands, wrote autographs, etc. Penn wrote a really good computer article for a long time in one of the PC magazines that I used to read religiously and they have a really funny movie that they did called “Penn and Teller get Killed” which I highly recommend. And they have many books, etc. on various tricks you can pull on people. In case you didn’t know, they are magicians and very good ones. Their last magic act in their show is amazing and I can NOT imagine how they do it. But then, I guess that is the definition of a good magician.